Windows 10 build 16188 brings a new security feature to Microsoft Edge called Windows Defender Application Guard, which protects enterprises against malware and zero-day attacks. Microsoft first revealed this feature in September and now Insiders can finally try it out. The general public will be able to test Windows Defender Application Guard in just a few months time after Microsoft launches the Windows 10 Redstone 3 Update. To turn Windows Defender Application Guard on, click Start, type “Turn Windows features on or off” and select the first result. After, check the Windows Defender Application Guard option, hit OK, and restart your computer. 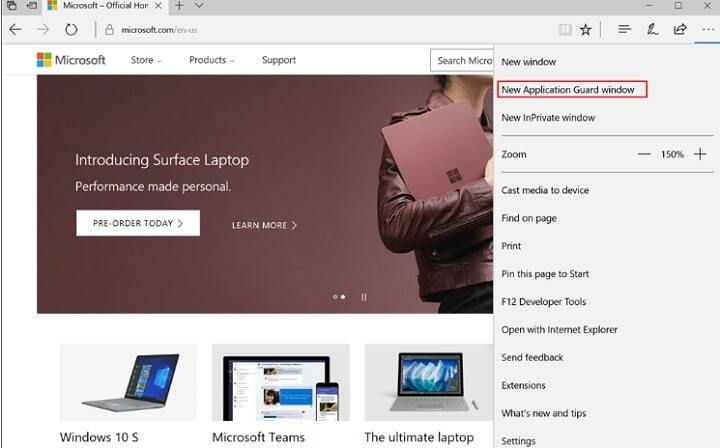 When you launch Edge again and click the menu, you’ll see a new option named “New Application Guard window.” When you enable this option, Edge will open a new window. You can then type any website in the address bar and that session will be isolated by Application Guard. As far as the technical requirements are concerned, Windows Defender Application Guard requires Windows 10 Enterprise Edition and Hyper-V.
[…] when an employee browses to a site that is not recognized or trusted by the network administrator, Application Guard steps in to isolate the potential threat. […] Application Guard creates a new instance of Windows at the hardware layer, with an entirely separate copy of the kernel and the minimum Windows Platform Services required to run Microsoft Edge. The underlying hardware enforces that this separate copy of Windows has no access to the user’s normal operating environment.